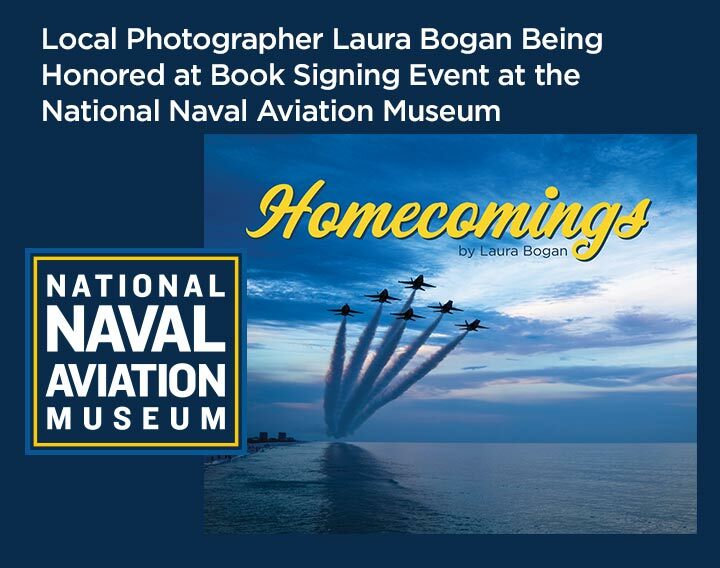 Wednesday, April 17 at 12:30 p.m.
April 11, 2019, Pensacola, Fla. Local photographer Laura Bogan will be signing copies of her new photography book, “Homecomings,” on Wed., April 17, at 12:30 p.m. in the Atrium of the National Naval Aviation Museum. Copies of the book are available for sale in the Museum’s Flight Deck Store. The book signing will take place during the U.S. Navy Blue Angels Autograph Session and is free and open to the public. The U.S. Navy Flight Demonstration Squadron—better known as the Blue Angels—is one of the most iconic and respected aerobatics teams in the world. For years, Bogan has been chronicling the Blues as they return to Pensacola, the team’s beautiful seaside home on Florida’s Gulf Coast. Through moments both triumphant and poignant, Bogan has captured stunning scenes that, until now, have only been enjoyed by those lucky enough to be there. Shooting from high in the sky, Bogan’s camera becomes the instrument through which she captures the breathtaking beauty of the Gulf Coast and the legendary Blue Angels. A graduate of Louisiana State University and the University of West Florida, Bogan is a strong believer in the power of images to tell stories in a way that no other medium can. She currently works for the Blue Angels Association and is a freelance photographer with clients across the Gulf Coast including the City of Pensacola, the National Flight Academy and the Blue Angels Association. “Homecomings” is registered with the American Wholesale Book Company, Baker & Taylor, Follett Library Resources, Ingram, and Partners Book distributors and available online with Amazon, Books-A-Million, Barnes & Noble Booksellers and Mascot Books. “Homecomings” is officially licensed by the Department of the Navy.